A naturally occurring member of the beta-carotene family found in both the plant and animal kingdoms, astaxanthin is a potent antioxidant that is nearly 500 times more powerful than vitamin E. The red pigment known to give carrots, tomatoes and salmon their distinctive colour is also very beneficial for human health. Free radicals are byproducts of normal bodily functions like breathing or digestion but their accumulation in the body is harmful to healthy cells. They lead to rapid aging, signs of which include early wrinkles, dry skin and even skin cancer. Free radicals also cause tissue damage inside the body which can lead to cancer. Antioxidants like astaxanthin neutralize free radicals and protect the body. To be able to attain anti-inflammatory benefits of Astaxanthin, you would have to consume large amounts of fish or other foods in which it occurs naturally. Since this is not feasible, many people prefer to take astaxanthin supplements. Sadly, a large quantity of the astaxanthin produced is synthetic and not as good as the natural product. Astaxanthin found in krill oil is a natural product that provides the full benefits without adversely affecting the aquatic environment. Bunea R, El Farrah K, Deutsch L. Evaluation of the effects of Neptune Krill Oil on the clinical course of hyperlipidemia. Altern Med Rev. 2004;9:420-428. 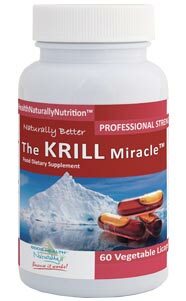 Krill Biomass and Sustainability Krill oil comes from a small crustacean living in Antarctic waters. But is the krill population sustainable? This article looks at this question.